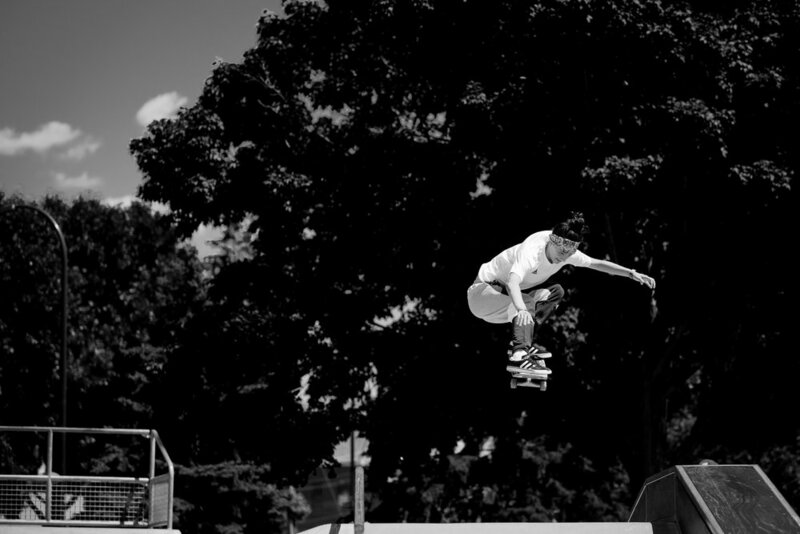 I grew up watching the X-Games, and got into photography looking at the photos in BMX magazines, so it was a bit of a return full circle this summer when I photographed skateboarder Mariah Duran for Ozy. Meeting Mariah just after she arrived at her Minneapolis hotel, I had a little over an hour to capture a full mix of portraits, action photos, and video clips for website loops. Knowing I would be shooting in the midday sun, I had scouted locations that would be filled with diffused, bounced light, or where the hard shadows could turn into crisp graphic elements. It was fortunate that there is a small skate park in the corner of downtown Minneapolis. While not exactly competition quality, Mariah was happy to stretch her legs and get some time on her board after a morning of travel, nailing some serious tricks for our shoot. Just two days after our shoot, Mariah clinched the gold medal in the X-Games Skateboard Street finals. Tre Jones of Apple Valley MN is one of the top 10 high school basketball recruits this year, and will join several other top high school players all heading to Duke for next season. Tre's older brother also went to Duke before getting drafted early into the NBA. Tre was wonderful to work with for this quick photo shoot between his high school practice and heading to watch the Apple Valley women's basketball team play a section finals game. SLAM Magazine was looking for a wide mix of images, with Tre wearing both his game clothes and street clothes. It was great to have James Corbett filming BTS of the photoshoot for part of a larger doc that Slam published about Tre - check out the behind the scenes video of the shoot and more photos from the shoot. Read more about Tre at SLAM Online. Watch a quick behind the scenes of my Slam magazine photo shoot with basketball player Tre Jones. Elevate Minnesota - A Campaign For Our Unions.